06/09/2018 9:36 PM - Saturday morning, Wichita residents were awoken a 4.5 magnitude earthquake. Saturday evening, the ground shook again as the Kansas City T-Bones rattled the Wichita Wingnuts 11-2 at Lawrence-Dumont Stadium. A pair of three-run innings and a pair of two-run innings helped lock down the game for Kansas City. In the top of the first, Kansas City put men on first and second with a single to center field by lead-off hitter Dylan Tice and a hit by pitch on Nick Torres. A two-run RBI double by Cal Towey just inside the center field fence brought home the runners and put the T-Bones on the board first with a 2-0 lead. The next batter up, Dexter Kjerstad, singled on an error by the shortstop, brought in Towey and made the score 3-0 KC. In the top of the second, Ketih Curcio singled to center field and was advanced by the next batter, Dylan Tice. Curcio then came home on an RBI single by Nick Torres, adding to Kansas Citys lead and making the score 4-0. The T-Bones would go on to have another three-run inning in the fifth. Kansas Citys Todd Cunningham led off the inning with a walk from Wichitas starting pitcher Jordan Cooper. The next batter up, Nick Torres singled to left center and advanced Cunningham to third. A sacrifice fly to center field by Zach Walters then brought Cunningham home, making the score 5-0. Cal Towey, hit by a pitch, advanced to first, pushing Nick Torres to second. A Dexter Kjerstad RBI double to left field sent Towey to third and scored Torres to bring the score to 6-0. With only one out, Adrian Nieto walked to load the bases with Kansas City runners. An Angel Rosa line drive to the shortstop scored Towey for the third run of the inning and the seventh run of the game on as many hits. The T-Bones would leave two men on base but added three runs to the board. Left center field continued to be a target for the T-Bones in the top of the sixth inning. Relief pitcher Seth Harvey led off the inning with a walk to Kansas Citys Dylan Tice. An RBI double to left center by Todd Cunningham brought home Tice, making the score 8-0 T-Bones. A double by Zach Walters to the left center warning track then brought home Cunningham, making the score 9-0. With two outs in the top of the ninth, Angel Rosa singled to center field, Keith Curcio singled to right field. Dylan Tice doubled, scoring Angel Rosa, putting KC up 10-0. An RBI single to right field by Todd Cunningham then brought in Curcio and gave the T-Bones a solid 11-0 lead. 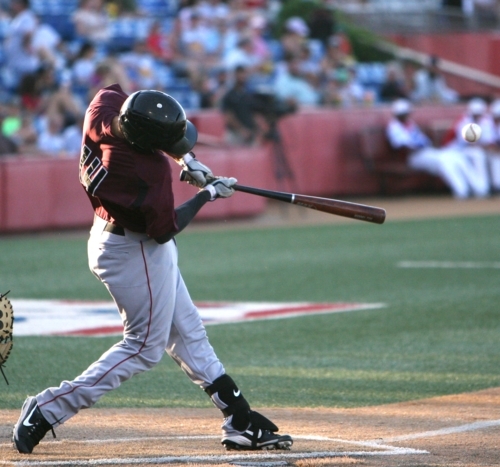 A bottom of the ninth home run to right field by Wichita first baseman Fernando Perez kept Wichita from being shut out. With one out, the Wingnuts rallied to score one more on an RBI single by Ryne Willard that brought home Tony Thomas. RHP Scott Carroll (0-0, 1.68 ERA) was the winning pitcher for Kansas City, throwing five innings, giving up four hits and no runs. Pasquale Mazzoccoli came in to pitch three innings of the game, giving up only one hit. Jackson Lowery finished the game in the ninth, giving up two earned runs on four hits. Losing pitcher for Wichita was RHP Jordan Cooper (2-1, 3.27 ERA) who went five innings, giving up seven hits and seven runs. Wichita saw relief work from five pitchers including Seth Harvey, Evan Sanders, Felix Carvallo, Austin Boyle and Brady Bowen. The loss for the Wingnuts marks the most consecutive losses at home for the team, which has lost six of its last six games in Wichita. The two teams meet up again Sunday for the third in a three-game series, where Kansas City will be looking for a sweep. You can listen to the Voice of the T-Bones Dan Vaughan call the game live on http://mixlr.com/t-bones-baseball/.